The Bridges opened for operation in 2009 with the goal of making a positive difference in the lives of residents who we care for and serve. 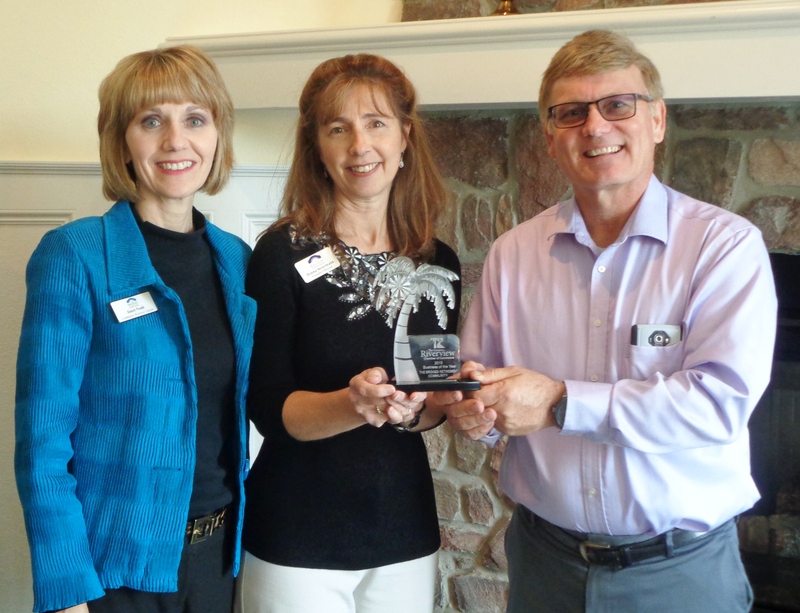 “We are honored to be recognized with this award and we will continue to strive to make a difference for the surrounding Riverview/ Brandon area in being a valuable community partner,” said Donna Steiermann, Executive Director at The Bridges. Riverview Chamber of Commerce President Bryan Thatcher presents the award to Donna Steiermann and Janet Noah of The Bridges. Making a major decision to move to an assisted living community can be stressful. Therefore, it is essential to have all the answers before signing the assisted living contract. Be certain you understand what type of care is included in each level and the price associated with the levels. Is an assessment conducted to determine the appropriate level of care? Who conducts the assessment? Will I be informed when an additional level of care is necessary? If my loved one is off campus for an extended period of time, i.e. receiving rehab, will the level of care be removed from the bill during that time? 2. Pricing and Additional Fees. You do not want to be surprised with additional fees when the monthly invoice arrives in the mail. Therefore, familiarize yourself with the pricing structure and ask questions. What is included in the monthly price? Is housekeeping and laundry included or is it extra? Is medication management a separate fee? Some assisted living communities charge a fee, based on the number of medications. Ask about all the amenities, such as local and long distance phone service, Internet access, transportation, etc., so you know exactly what is included. Ask to review the lease in advance. If you have questions, they should be addressed prior to moving in. Most often, the term of a lease is one year. You will want to know when the rent is due and how to make the payment. Be sure to ask what happens if a resident elects to terminate the lease; is there a penalty and how much notice must be given? What happens if a resident passes away? The assisted living contract is a legal document and therefore, it is imperative that it be explained and understood. When looking for an assisted living community for a loved one, you may want to begin your search with a virtual tour. By clicking on the video below, you will familiarize yourself with The Bridges community and obtain a better understanding of assisted living. Frequently, families are unsure when assisted living is appropriate for their loved one. There are numerous signs or clues that it might be time for mom or dad to transition to assisted living. Some may feel as though they are giving up their independence; however, assisted living does not mean you no longer have control. At The Bridges, we want residents to live as independently as safely possible. Our team is here to provide assistance and supervision with day to day care needs of our residents, which gives families peace of mind. Having Registered Nurses and Licensed Practical Nurses on our nursing staff sets The Bridges apart from other assisted living communities in the area. One or more of our nurses is here for 16 hours each day, seven days each week; this ensures that our residents receive closer supervision of their clinical symptoms and disease processes. Nurses notify physicians of significant changes, review medication orders to ensure that the medications on hand reflect the most current physician orders; they also communicate lab and mobile x-ray results to physicians, monitor blood sugar levels and insulin administration. Our nurses also take an active part in educating residents and family members regarding the reasons certain medications and tests are ordered. But probably the most important role our nurses play is to communicate often with all of the residents’ physicians, both primary care and specialists; this constant flow of communication allows us, in a very timely manner, to obtain orders to treat clinical issues that might otherwise have resulted in a trip to the Emergency Room. Our nurses Jeff, Jared, Jackie, Director of Resident Care, Deanne and Yolanda (not pictured), make a positive difference for our residents each and every day! 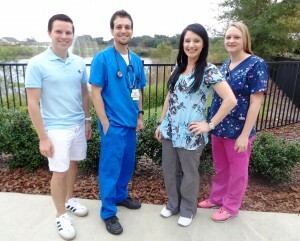 Our nurses including Jeff, Jared, Jackie and Deanne. The Bridges Retirement Community was recently granted a citation-free survey by The Agency for Healthcare Administration, the state agency that oversees the operations of all assisted living facilities in Florida. The purpose of the unannounced visit by the Agency was to conduct a biennial inspection of the facility to verify compliance with the many rules and regulations that are required of a licensed assisted living facility and ensure that residents are happy and well cared for. The survey process inspects all areas of an assisted living facility including nursing care, medication management, employee training, meal selection and service, cleanliness and input from staff, residents and family members through private interviews conducted by the surveyors. You’ve finally made the decision to begin touring assisted living facilities. You will soon discover each facility, not unlike each person, has its own personality. It is important to bring a checklist, or mentally carry one with you when you tour. Part of your tour will include observation and the other part question and answer. Below is a simple checklist to use as you tour facilities. 1. Are the grounds well-maintained? 2. Is the facility attractive, clean and odor-free? 3. Are there different floor plans? What is the square footage of each? 4. What are the amenities? What is the fee for each? 5. Is there an activities calendar? Ask to see the calendar. 6. How are residents encouraged to attend activities? 7. Are there options at every meal? Ask to see a menu. 8. Is there an entrance fee? 9. Is there 24-hour staff on-site? 10. What is the monthly rent? Is their an entrance fee? 11. Is transportation available? Is there a fee? 12. How are medications managed? 13. Do the residents appear to be happy? 14. What is the interaction between residents and staff? 15. How many residents live at the community? Once you have toured 3 or 4 communities, you will notice the similarities and differences of each. Using your checklist of answered questions and observations, you will soon determine the community most appropriate for you or your loved one. 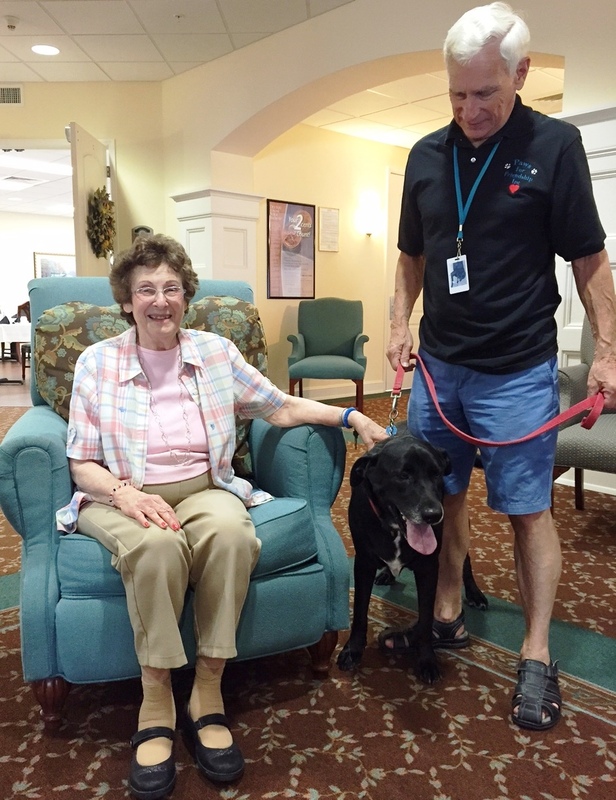 When Rex, the black lab, and his owner walk into The Bridges Assisted Living Community, senior residents are eager to greet them. Rex is a pet therapy dog operating under PAWS for Friendship. A non-profit organization, Paws for Friendship is comprised of volunteers sharing the unconditional love of their personal pets with others. Anyone who has stroked a dog’s fur knows the soothing and comforting feeling a dog provides. Mary is a resident who will stop what she’s doing to spend time with Rex. She lights up when Rex sits on the floor next to her chair while she gently pets his slick black coat. 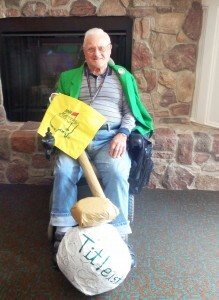 After Mary, Rex will make his way to the other residents sitting in the lobby who want their turn with him. The next stop for Rex is visiting with residents in the Memory Unit. While they may not be able to remember his name or that he has ever visited them in the past, these residents are delighted to see his wagging tail. They, too, want a turn petting Rex and patting him on the head. Studies show that even short periods of time interacting with a dog can lower blood pressure, reduce stress hormones and increase levels of serotonin, the “feel good” chemical, in the brain. Rex is only one of many dogs who visit residents at The Bridges. These special pets make people feel happier and healthier! Dancing is more than moving your body; it is also working your brain. Our brains are the directors of our bodies’ movements. The more moving you do, the more the brain is stimulated. At The Bridges Assisted Living Community, our residents have many opportunities to move and groove and exercise their brain at the same time! 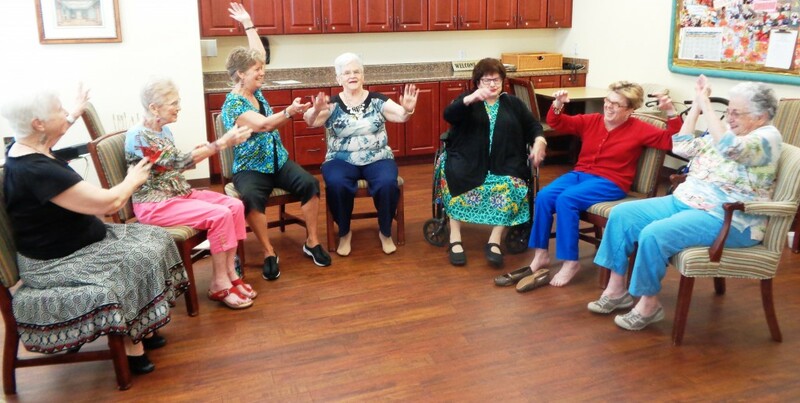 Take for instance our Chair Dancing class. While seated in a chair, residents move their arms, legs and body in an instructed method to the music of their era. This popular class is fun and beneficial. A new addition to our Activity Calendar is a class called “Brain Dancing”. This class specifically targets the brain with body movements. For example, the instructor will ask participants to write their name in the air using their elbow. (Give it a try; it’s not as easy as it sounds). Next, participants may be instructed to use their arms and body to sway like a tree to the soothing music. For sixty minutes participants use different body movements all while working their brain and their body. The website, Examined Existence, reported, “A study conducted by researchers from the Albert Einstein College of Medicine proved the benefits of dancing on the brain. The study, which was published in the New England Journal of Medicine, shows that dance is the best exercise to improve a person’s cognitive skills – whatever age he might be. The research, in fact, targeted senior citizens to determine which activity reduces the risk of dementia. As per the results, 76% of those who danced frequently exhibited lesser signs of dementia, compared to those who answered crossword puzzles and read often.” While dancing is good cardiovascular exercise, it turns out it is also good exercise for our brains. Is it time for a move to assisted living? Determining the right time to make a move to assisted living is different for each individual. However, there are a number of clues that signal it may be time to consider assisted living for your loved one. Have you noticed that your loved one has not taken their medication or taken it incorrectly? Are medications expired? Are there stacks of bills that have not been paid? Do you find unopened mail? Is your loved one able to prepare meals for themselves? Do you find expired or moldy food in the refrigerator? Are they able to safely use kitchen appliances? Has it become difficult for your loved one to maneuver safely in their home? Are they at risk for falling? Is the yard or home kept neat and tidy as it used to be? Is your loved one able to maintain their home as they used to? Do you find your loved wearing the same clothing day after day? Are they able to bathe and groom themselves? Is your loved one capable of laundering their clothing? Does your loved one have friends they don’t see as often as they used to? Are they unable to attend social functions? While making the decision to move your loved one to an assisted living community can be a difficult one, ensuring that your loved one is safe and well-cared for will give you peace of mind. Residents of The Bridges Assisted Living Community were treated to an indoor game of miniature golf. The course included six holes with varying degrees of difficulty. At hole 3, golfers were faced with a pond of water to putt over, while hole 4 was set up with a challenging sand trap. All levels of golfers were encouraged to try their hand at a fun and somewhat competitive game. The winner was awarded with a trophy and sported a green blazer. Pete Zylman was the big winner of the putt putt tournament.